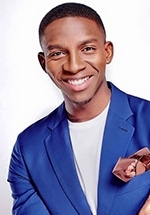 Lawrence Maleka is a South African actor and presenter best known for hosting the Mzansi Magic reality competition series Clash of the Choirs South Africa, replacing Bonang Matheba for the third season in 2016. He was previously the co-host (with former Big Brother contestant Vimbai Mutinhiri) of the AfricaMagic Entertainment celebrity gossip show Star Gist, from 2012-2014. Lawrence got his start as presenter of The Gadget Show on community TV station Soweto TV, in 2009. He hosted a number of other shows for the broadcaster, including Ziyamporomo and Street Radio. In 2011 he hosted a below the line promo show for Coca Cola on e.tv called Coca Cola Happiness and in 2014 he was one of the celebrity contestants on the e.tv game show I Love South Africa, appearing in Season 1, Episode 5. Two of his fellow contestants in that episode - performance poet Busisiwe Gqula and singer Bucie Nqwiliso - would later join him as Choirmasters on Clash of the Choirs. In May 2015 he replaced Fezile Makhanya as the presenter of the lottery game show Lotto Powerball, airing on e.tv on Tuesdays and Fridays. Also in 2015, he had a recurring role as Don Webster on the third season of the Mzansi Magic soapie isiBaya. In late 2015 it was announced that he was replacing Bonang Matheba as host of the Mzansi Magic reality competition series Clash of the Choirs South Africa, his highest profile role to date. On 9 September, 2016 he made his debut as the new co-host of the e.tv youth and lifestyle music show Club 808, joining Boity Thulo. In 2017 he was the host of the SABC3 reality competition series The Final Cut, in which contestants face weekly dramatic challenges in order to win one of two parts on SABC drama series.